What did you expect from Lee News? i have known annete eckert since college. she is a classy, principled lady. if plummer wants to complain about pension abuse he should get his facts straight. the newspaper is derelict in its duty to inform the public about what the truth is. You can white-wash the 1st press release. Jason Plummer weasel-y way of not knowing how to add the number of pensions (yeah, ok) … and trying to smear the wife … WIFE … and the son… SON… of your opponent reeks of a rich kids “hail Mary” pass of a fading campaign. We will see how the press goes and … how its covered. A tantrum from someone who ran in a district that really could not support a Republican anyway, who believes that politics begins at the top and works down for candidates under 30. Go figure. His 15 minutes is up. Are folks in Southern Illinois down on people collecting the pensions they earned for public service? Somehow, I doubt it. I’m quite certain the folks in Southern Illinois know how to count, too. I always read the Daily Egyptian in my Carbondale years. Rich….someone just commented on the Southern web site story saying Plummer was “blatantly lying” and said if they want an accurate report to check the CapFax link he posted. Typical of much reporting these days. You’d think every single person who gets a pension from anywhere is raking in hundreds of thousands of dollars at a minimum. Gotta whip up the outrage any which way you can. Because….? If readers only knew half the truth they’d be ashamed they read much of anything some papers report, like the Trib. The Southern has to keep bolstering its case for endorsing Plummer, after all. The best argument they had Sunday was Shimkus should just get to vote twice. This is about selling newspapers. Newspapers need advertisers to support their business. If it bleeds, it leads. This is a fine example of how low the media has stooped to support this type of mudslinging in order to increase their bottom line. There should be a limit on how many public pensions one person can collect. More good work by Rich Miller. Fox News and MSNBC could use you to restore some sanity. Just sayin’. Is this what this race has come to? Jason’s Dad doing all he can to get HIS son relevency, while Jason’s Dad and Jason attack Enyart’s SON and WIFE? Why? It’s no different than any other job. If you work for multiple employers during your lifetime and have paid into pensions at each employer you are going to get something from all of them when you retire. Pointing out legitimate pension abuses is fine. This isn’t one of them. Honestly asking a question here. How big of a deal is the Southern Illinoisan in this district? Wouldn’t the P-D/Metro East papers be dominant? That part of the district is crucial in a general election. Another example of why even Republicans down here have trouble supporting the Illinois Republican Party. Fielding candidates like Plummer is actually embarrassing and impossible to defend. Because there’s a difference between public and private sector pensions. And Illinois ranks 50th in underfunded pensions. In the Metro East here, the pension abuse is rampant and people are sick of it. Senator Bill Haine collects a $137k/year pension from Madison County after working for 12 years as the state’s attorney and some part-time years as a county board member, while he collects his state senate salary, and has a state pension on the way. The Southern reads a lot like Fox News these days. All polls from both sides have Haine leading by huge margins, so I’m not quite sure where you get your data. If the ILGOP can’t find better candidates, they deserve the election losses that are coming. To think, Plummer was the LG candidate two years ago. Further proof that the Southern Illusion has earned its nickname. The P-D/Metro East papers are two to two-and-a- half hours away….on a good day. But yes, the bulk of the district’s population is in that area. I think the next thing they say is … Haine’s pension is funneled to the Enyart family. Sen.Haine earned his pension and paid into the IMRF just like all other local public officials do. He was eligible to collect his pension as granted by the Ill. constitution. BTW nobody complained when Sen. Bowels collected her pension and was a state Sen.and she was loved by many people in Madison county. I guess with my five hunderd dollar a month state pension I am on the dole too. Next thing I will have to say I`m sorry for serving in the Army in the Viet Nam war too. Jason Plummer and his kind can go to hell. Some of us are about to get stuck with the real Oberweis as our Senator–not a laughing matter. East Sider, if you don’t like the pension situation in Illinois, move to Missouri. You will find plenty of kindred souls over there. But first, recognize that more studies than I can count all show that it’s the failure to fund, not the size of the pensions, that caused the funding problem. From the way you write, you may have a size problem of your own. Senator Haine has been in the fight of his life in this race, in a safe district where he was supposedly a legend, against a political novice. He’s had to spend over $1mil to defend his seat. But is it ‘Data’ or ‘Opinion’? He’s raised a million. Not sure he’s spent it all. But, yeah, lots of people, including me, thought he was in for a really tough race. Didn’t turn out that way. East side are you complaining because Senator Haine is spending money to get reelected? If it weren’t for the the RSSCC and the IRP Senator Haines opponent wouldn’t raise enough money locally to fund a walk piece. Stop your whining . Actually, most of the challenger’s money is coming via independent expenditures these days. You must be getting your election info the same place you are getting your pension info. You aren’t even close on either. Fox News and the Southern Illusion are not “real” news sources FYI. Jason is a worthy exponent of the current GOP policy of de-emphasizing math in campaigns. Are you sure that you’re not mixing up the Haine-Babcock race with the Beiser-Smith race. Most of the independent expenditures (about $50K)in the 56th Senate race seem to be in favor of Haine rather than opposed to him, while in the 111th Assembly race about 40K has been spent almost exclusively against Beiser. On Tuesday, Jason Plummer, Enyart’s Republican opponent, released a statement slamming Enyart on pensions, saying: “Enyart, who served as a political adviser to convicted felon Rod Blagojevich and Governor Quinn, and his wife Annette currently collect three taxpayer-funded pensions that pay more than $156,000 each year. 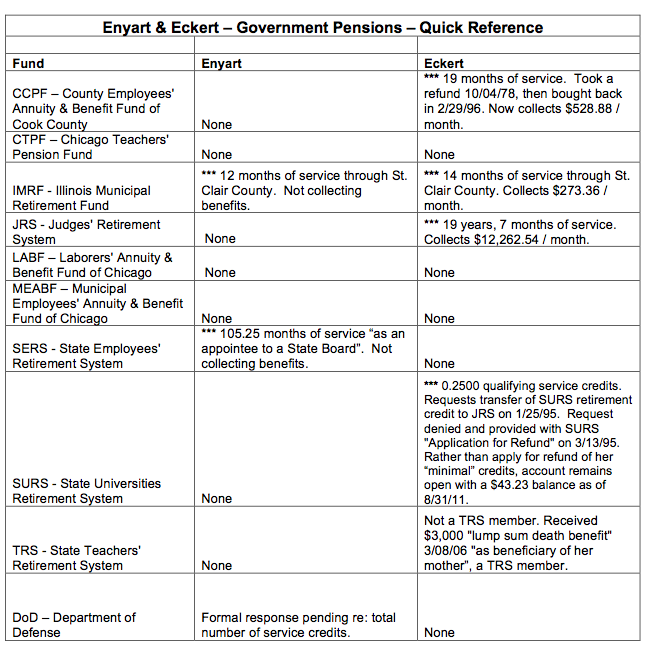 With his household in line to receive at least four more taxpayer-funded pensions, how much more will Enyart collect off the backs of the taxpayers?” This is what was reported online in the St. Louis Post Dispatch, Lee Enterprise paper, as released by the Plummer campaign. The St. louis Post is a liberal newspaper. The release doesn’t say currently getting 7 pension, as printed above. =And while Plummer claimed that Enyart and his wife were receiving seven pensions, Enyart’s wife was receiving three, two of which are quite small.= The press release printed in the St. Louis Post may be wrong. Rich, you may want to contact them and tell them their information is incorrect. There was no major misstatement by Plummer campaign. It is entirely possible that Plummer is lying about the number of pensions the Enyart family is receiving, and that the Enyart family really are making themselves into government pension millionaires by taking money from the working poor in Illinois. Only Mississippi taxes poor people at a higher level than Illinois, and these lavish $100,000/year government pensions are a big reason why the poor in Illinois are being punished harshly by the Democrat powers in this state. This is another great example that shows we can not trust either power party if we truly want our economy and society to survive for future generations. Yep, I did. Watching a couple dozen races sometimes does that to ya. Good Lord. And people wonder why the state is going broke. My dad worked at McDonnell Douglas/Boeing for over 30 years and his pension is less than $450 a month. I don’t even have one. I understand completely why they don’t want this double dipping to come to light. Didn’t the press release state the couple “currently collect three . . . pensions”? Unless Judge Eckert doesn’t share her money with her husband, I assume the couple is taking in over $13,000 per month from the state. The Judge did a great civil service to Illinois, but the state pension system is whack (hence the attempted reformations in the past few years). I don’t see why mentioning her current three pensions is so insulting. But whatever. Plummer’s rich too from his dad. And I do agree about not understanding where they get the potential 5 more “pensions” from. Ns, Enyart doesn’t “collect” any pension. His wife does. Okay. Just seems like an argument over conjunction use. Oh well, nothing major. Actually, it’s about attacking a spouse, and a son. But Jason wouldn’t know about that. Thank you, Rich, for pointing out the obvious. Now, East Side, about your case of pension envy..
East Sider, I worked in local government in another state, in the private sector in another state, in local government here, and now in the private sector here. My Mom died after working as a secretary for the federal court system…I got a death benefit then. My goodness I am a penta-dipper once all this dough rolls in. Now the facts…$100 a month for the other state system, about $140 for the other state private entity, about $1,100 a month for the Illinois local government work, and maybe (let’s wait and see when I retire) $500 a month for the private sector work. That’s $1,840 a month. Methinks Lt (jg) Plummer knew he was at best exaggerating, and at worst distorting the facts, but did so anyway in a desperate attempt to bolster his flagging campaign. Editor Gary Metro jumps critically on anything having to do with pensions or benefits for public employees. He has lost my respect. Is there such a thing as a poor person running for office? Is there such a thing as a poor politician? All the campaigning seems to be about how much money each candidate comes from. Tell me something people…why is working honorably in a public sector position, and earning a pension deemed dishonorable by the right wing of the Republican Party? And doing so in the private sector not so? Where I come from that’s called a good choice of careers. If everyone with or in line to get a public pension canceled their Southern Illinoisan subscriptions, there wouldn’t be a person outside that newsroom reading the paper. Just out of curiosity, is this the same AA from the “old days”?